Electricity generators at the EWMC - which use landfill gas as fuel - began operations in October 2005. Landfill gas is produced when organic waste like food scraps, grass clippings and leaves decompose inside a landfill, where there is no oxygen. It is a mixture of approximately 50% methane and 50% carbon dioxide and other trace gases. One tonne of organic waste can produce 125 cubic metres of methane, the energy equivalent of one barrel of oil. The methane in landfill gas is poisonous, flammable and lighter than air. It can migrate to the surface and potentially become an explosion risk if it becomes concentrated in an area where there is an ignition source. If not contained or extracted in a controlled program, methane could move through the ground and enter the basements of nearby buildings, creating health and explosion risks. It is also a potent greenhouse gas. How does the City use Landfill Gas? Since 1992, the Clover Bar Landfill has been mined to produce electricity from landfill gas. Enough gas is captured each year to satisfy the electricity demands of approximately 4,600 homes. To date, over 101 gas wells have been drilled into the landfill's decomposing waste. Currently there are 70 wells, each approximately 25 metres deep, in service. 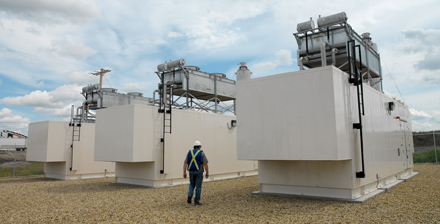 They are connected to a pipe network that conveys the gas to a Landfill Gas Recovery Plant, owned by Capital Power, on the Edmonton Waste Management Centre (EWMC) site where it is cleaned of impurities. For the first 10 years the cleaned gas was piped to a nearby Epcor electrical generating station where it was used as fuel to generate electricity. In 2005 Epcor built smaller generators next to the Landfill Gas Recovery Plant. The new generators are able to supply 4.6 megawatts of electricity into the electricity grid, again, enough to power over 4,600 homes annually. The Clover Bar Landfill site was the first landfill in Alberta that recovered gas for use to generate electricity. The volume of gas sent to the generating station each day is greater than 50,000 standard cubic metres. The Clover Bar Landfill is expected to produce gas until at least 2060. Currently, 64 facilities across Canada recover landfill gas. Some 27 million metric tonnes of carbon dioxide equivalent methane from landfill gas is generated in Canada from landfills annually. These reduce greenhouse gas emissions from landfills by some 6.9 million tonnes of carbon dioxide equivalent each year.